The Day of the Cross, or Dia de La Cruz, taking place on May 3rd, is a very old religious ceremony, particularly in Santa Cruz, as the date coincides with the founding of the city. On May 3rd, 1494, there was a ceremony on the beach of the city, where a certain Fernandez de Lugo, the military governor at the time, erected a wooden cross to officially found the emerging metropolis. The day of the Holy Cross (which is celebrated throughout Spain) is the same day and, like so many other events in the Spanish calendar, have an interesting history to their origins. Tenerife's "Day of the Cross" dates back to the time of Emperor Constantine I, which is around the 4th century BC. Legend and some religious texts have it that Constantine and his army were due to do battle with a mighty hoard of Huns, a race of people who had once enjoyed an empire stretching across Europe, led by the famous Attila. The evening before the fight, Constantine was desolute, fearing that his small army was no match against the might of the opposing force. He slipped into anxious sleep and it is said that he received a vision - an angel and a shining cross. Accompanying the cross was a message: "With this sign, you shall win". The next day, Contantine ordered a cross to be constructed, which he used to lead his army into battle. His men emerged victorious. Thereafter, the Emperor looked into the implications of the cross and found that it was a Christian symbol. 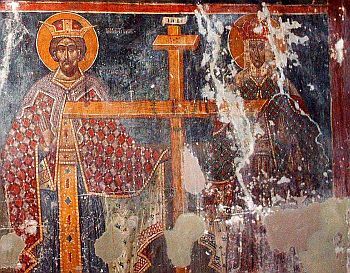 He subsequently became baptised into the Christian religion (becoming the first Christian Roman emperor), ordered the building of churches and dispatched his mother, Elena, to Jerusalem to find the true Cross of Christ. On arrival, Elena gathered together all the priests and commanded them to tell her of the whereabouts of the true Cross. She had to resort to torture, but received the information. At the location she was given, three different pieces of wood were found. In order to determine which one was the Cross she wanted, each was placed upon a dead body. One returned the body to life, so she had completed her quest. The third of May is designated as the day of the Cross because that is the date that Elena is alleged to have finally found what she was looking for. In Tenerife, the Day of the Cross is celebrated in style, with representations of the Cross adorned with flowers and other decorative objects. There are colourful, vibrant processions celebrating this day. In Santa Cruz, which has a double reason to rejoice, there are also costume parties. Other noteworthy cities, such as Puerto de La Cruz and Los Realejos, have amazing firework displays.